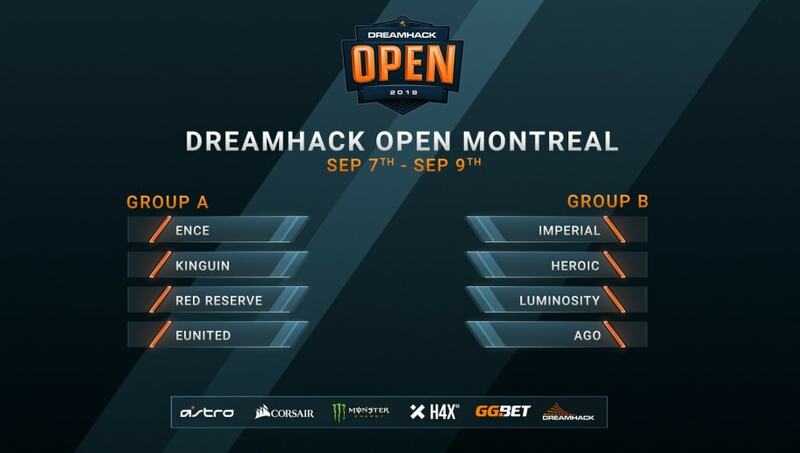 The groups for DreamHack Montreal were revealed Wednesday in a tweet published by the DreamHack Counter-Strike Global account. Group A will include Ence eSports, Team Kinguin, Red Reserve and eUnited, while Group B will feature the Imperial, Heroic, Luminosity Gaming and AGO Esports. All eight ​Counter-Strike teams were invited, eschewing the tournament typical series format of six invited teams and two teams qualifying through previous tournaments ​because of scheduling conflicts. The #DHOpen Montreal groups are here! Each group will play out a double elimination bracket where opening and winners matches are best-of-one while elimination and decision matches are best-of-three. The top two teams from each group will advance to the playoffs, a single elimination, best-of-three bracket. The prize pool totals $100,000, with $50,000 going to first place. The rest of the teams will split the remaining money according to their placements in the tournament. The tournament is scheduled to begin Sept. 7 and conclude Sept. 9. How many times do you go to the cinema? What film genres do you like? What are the main reasons you visit the cinema? What social platforms do you consume movie content? Do you intend to go to the cinema to watch The Predator this September? Why do you intend to go and watch The Predator?